welding plug | Product tags | Waltco Tools & Equipment, Inc. 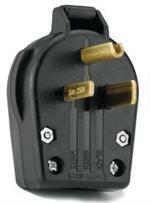 Heavy duty vinyl pin-type design electrical plug with two brass blades and half pin. 30/50 Amp, 250 Volt capacity. 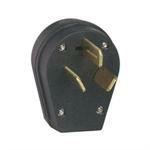 Hardened bakelite crowfoot-design portable electrical receptacle with heavy rubber insulator. 50 amp, 125/250 volt capacity. NEMA 10-50.